“In our minds the VMAX was always there. It always was an iconic Yamaha model, not in terms of sales but in terms of being loved by bikers.” says Yamaha Europe Product Planning Manager Oliver Grill. “VMAX is a specialized and extreme concept: The most overwhelming and explosive acceleration experience!”, Oliver continues. The previous VMAX had 4 downdraft carburettors. The V-Boost system, equipped on the american model, opened butterfly valves in the intake tract of the engine from around 6000 rpm onwards. When the butterfly valves opened, each cylinder was fed by two carburettors instead of one, and this resulted in a surge of power at high rpm: the famous V-Boost! “Our engineering target was clear: give a ‘continuous V-Boost feeling’, at all rpm, at all speeds” mentions project leader Hajime Nakaaki. “Our first big challenge was to find what engine was best, our second big challenge was to put it in a chassis and make it work!” say project leader Nakaaki. Oliver adds “The bike is extremely powerful and built for full acceleration, so the basic layout is designed to be completely solid and stable in that condition. What about the design? “We wanted to stay loyal to the strong design values of the previous VMAX” says designer Takeshi Umemoto. First, a brutal and macho silhouette of the bike. Second, to have the V4 engine as the most prominent design feature. Though the bike has a strongly dimensioned aluminium frame: this aspect is almost ‘hidden’ in the design! 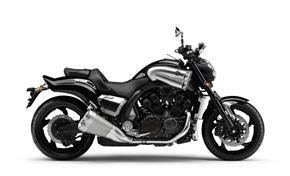 With 1679 cc, the VMAX is the biggest 4-cylinder mass production motorcycle. It’s also the strongest to date, with a record 200 PS at 9.000 rpm! And even more impressive then the horsepower output, are the torque figures with 166.8 Nm at 6.500 rpm. • Compact, 4-valve, pent-roof combustion chambers. • Straight valve angles: 14 degrees for the intake, 15 degrees for the exhaust, where the previous VMAX had 18 degrees for both intake and exhaust. Straighter valve angles help to optimize the port shapes. • Shorter stroke design: Bore x stroke is 90.0 x 66.0mm where the previous VMAX had 76.0 x 66.0 mm. • High compression ratio: 11.3 to 1, where the previous VMAX had 10.5 to 1. • Iridium spark plugs: for extremely efficient combustion at all engine revs. • Forged aluminium pistons: these are stronger and can therefore be built lighter, which means less reciprocating mass, less vibration and easier revving of the engine. • The cylinders are ceramic-composite plated. This gives a high precision and leads to less frictional losses, and more durability. • The connection rods are produced with the 'fracture split' method. This makes the holes for the big-end bearings extremely precise and strong. This technology was recently introduced on Yamaha’s other flagship, the R1. Instead of manufacturing two separate halves, these carburised rods are manufactured as one single piece. The forged rod is then super-cooled and then fractured, which causes a clean break with perfectly matched surfaces on each half. This renders a perfect fit when the two halves are then bolted around the crankshaft. Despite the 40% higher engine capacity, 1679 versus 1198cc, and the extreme horsepower figures, the new engine of the VMAX is built more compact than the previous one! • The V-bank angle is 65 degrees, where the previous VMAX had 70 degrees. This allows the engine to be 27mm shorter. • The camshaft drive system is a combined chain/gear drive which keeps the cylinder head compact. In a conventional system, the cam chain runs over both the intake cam sprocket and the exhaust cam sprocket. Both sprockets then need to be large, and have a clearance between them. With this new, combined design the cam chain drives the intake cam sprocket, which in turn has a smaller size gear connection to the exhaust cam. Since the gears are smaller sized than the sprockets, and connected together, the whole design is more compact. • Crankcase and cylinders are made in a 1-piece construction (aluminium, open-deck type cylinders with ceramic plating). • Magnesium alloy crank case covers help to even further reduce the weight. This applies to the clutch cover, ACM cover and drive shaft cover. • The mufflers are made of lightweight titanium. They are also designed to be short and upswept so the exhaust sound can be heard well by the rider, to enhance the feedback between engine and rider! A high capacity, high-performance engine like this one has a strong engine brake effect. A slipper clutch was needed. It is a ramp-type slipper clutch, designed so that under strong back-torque (from wheel to engine), the clutch will start to slip. This is to help to prevent rear wheel blocking or jumping when shifting down and closing the throttle at high rpm, just like on Yamaha’s supersport bikes R1 and R6. This system shortens the intake ducts at higher rpm. For reasons of air pulsation frequencies, short intake ducts let the engine breathe better at high rpm, while long ducts are beneficial at low rpm. YCC-I helps to get the best power output throughout the rev range. The system instantly ‘lifts’ a funnel away from the intake tract when the engine revs over 6650 rpm. If the funnel is connected to the intake, the intake duct length is 150mm and when the funnel is lifted away, the length is 54mm. Yamaha's latest R1 and R6 models also use YCC-I. This is a kind of 'fly by wire' throttle system that has been derived from MotoGP racebikes and has already been successfully introduced on the Yamaha R1 and R6. This intelligent system, calculating every millisecond, 'translates' the rider’s throttle opening, combined with various input signals like speed, air temperature and many others, into a corresponding best angle in the intake duct. It helps to achieve a smoother engine torque character and a higher level of rider-machine unity due to a more accurate throttle response. For example it prevents poor acceleration performance when the rider opens up the throttle too quickly whereby the intake airflow speed would drop. YCC-T also simplifies the air intake passage because there is no need anymore for sub-throttle or secondary throttle systems. Therefore, a clean and short air intake can be designed which is beneficial for high-rpm power! The fuel injection has a very sophisticated control system and 12-hole injectors for a fine fuel spray, which results in better combustion and engine power. It also contributes towards keeping the emissions low, supported by an O2 sensor feedback system for optimized combustion efficiency, a 3-Way honeycomb catalytic converter in the exhaust system, and an Air Injection System (AIS) injecting fresh air into the exhaust ports to further reduce emissions. Same as YCC-I and YCC-T, EXUP (EXhaust Ultimate Power valve) was developed by Yamaha as a special valve in the exhaust system, adjusted to suit engine revs. At lower rpm it is closed, to create backpressure in the system which is beneficial for torque and sound characteristics. The VMAX has a governed top speed of 220km/h, by a smart system, that still allows a complete quarter-mile run under full acceleration. Yamaha applied all their chassis development expertise to create this machine to offer both the straight-line stability a 'drag bike' needs, as well as the neutral and confidence-inspiring handling the rider needs in everyday situations. The aluminium frame construction is strong and rigid as well as lightweight. The main frame, combined with the engine as a stressed member, creates an immensely strong construction directly from head pipe to rear pivot. • The rear frame’s bottom section, which is a straight-line support, is made of extruded aluminium. • The engine brackets are made of cast iron, which is more vibration-resistant to flexibly absorb high stress loads on these attachment points. The swingarm is made of lightweight cast aluminium. It has a long design (662.5 mm, where the previous VMAX was 487mm), which is beneficial to suspension function and to traction and road holding on bad surfaces. Interesting detail: the swingarm is pre-equipped with M6 size threaded holes to easily attach race stand pick-up hooks! The new VMAX has modern 18 inch cast wheels, where the previous VMAX had a 15 inch, disk type rear wheel. The wheels are equipped with low-profile tyres that were developed especially for this machine. The massive 200 mm wide rear tyre offers good handling performance together with impressive looks and impressive acceleration performance from standstill. The 15-litre fuel tank is located under the seat for better mass concentration. The riding position is upright and 'in control'. Combined with the low gravity of the total machine, the new VMAX has a stunningly good handling! The new VMAX features modern, fully adjustable suspensions. The base setting represents the optimum balance between front and rear, also under strong acceleration conditions. • The front fork is a massive 52mm cartridge type front suspension, with oxidized titanium coating on the front fork inner tubes with less inner friction in the system. This gives a more sensitive suspension and better road holding. • Front and rear suspensions are fully adjustable in preload, compression and rebound damping. The rider can adjust it exactly to suit his or her needs. Interesting detail: The rear suspension has special ‘remote’ adjustment buttons, easy to reach! • The monoshock type rear suspension has a progressive link system, no comparison to the conventionally mounted twin shocks used on the previous VMAX. The VMAX has a top spec, very powerful braking system, including ABS. • Large, 320mm diameter front disks are operated by monoblock 6-pot calipers with radial mounts. The radial mounting reduces the torsional forces in the system for a better brake feel. The monoblock calipers are very rigid and the 6-pot system divides the brake pressure over the whole surface of the brake pads more precisely. This gives great feeling and feedback combined with outstanding stopping power. • The Brembo brand front master cylinder has a radial pump for a direct feel. • Front and rear disks are wave type, for modern looks and better heat dissipation. • ABS is standard equipment. The compact lightweight technology featured is the well-proven, quick-responding system which is also fitted on the 2008 FJR1300A. The VMAX is a top of the range bike with attention to every detail. Below we describe some examples. The dashboard contains an analogue rpm counter with integrated digital speedometer on the handlebar. There is a shift flash (shift timing indicator LED light) on top of this. The rpm at which the light will flash is adjustable, for every gear separately! Yamaha’s R6 and R1 also use an adjustable shift flash, but these use a general adjustment, not for each gear individually. The VMAX system is even more sophisticated in this respect. In addition to this, there is a Multifunction display on the tank. This is not an ordinary LCD, but a new type of OEL (Organic Electro Luminescence) display that is brighter and easier to read compared to LCD’s. The new VMAX has an immobilizer ignition system, which is designed to reduce theft. The ignition key has a coded chip integrated, and the bike must recognize this code in order for the bike to start. Without, the bike won't start even if the ignition is turned or forced into the ‘on’ position. The shaft drive system keeps the bike impeccably clean, is virtually maintenance free and reliable. The VMAX features a very high quality finishing, built by people who love motorbikes! • Abundance of high-quality aluminium parts, forged aluminium pedals etc. • Adjustable clutch and brake levers, and hydraulic clutch operation. That’s what the new VMAX is all about!